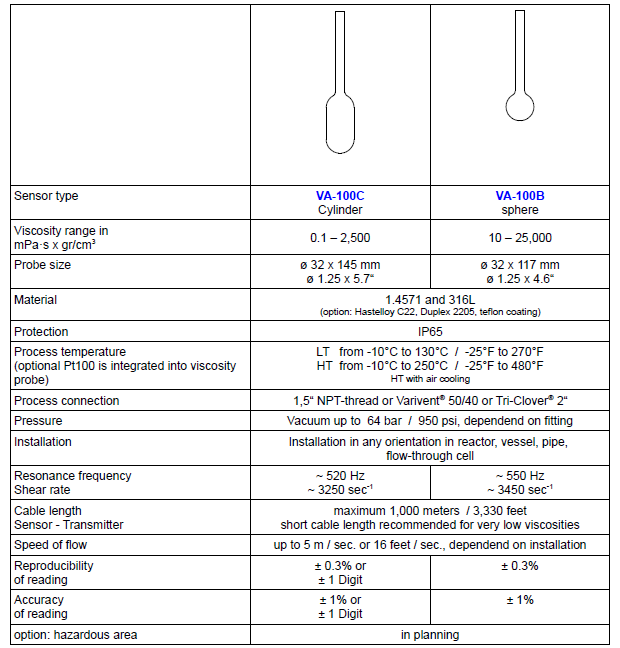 VA-100 series ViscoScope sensors are manufactured to be compatible with standard installations and are available with metric and NPT threads, Tri-clover® or Varivent® fittings. The units can be installed in flow through cells, small tanks and pipes with narrow diameters. The sensors are designed for use in low and medium viscosity media up to process temperatures of 270°F (130°C). They are particularly suitable for the areas of paints, lacquers etc. Sometimes process technology, applications or local conditions demand the design of the special instrument. The VA-100S (special) sensor is designed for these applications.